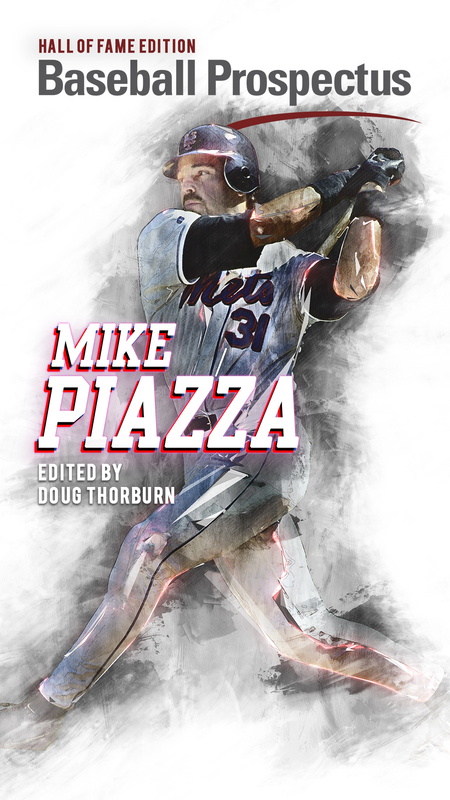 The Blue Jays STUFF Report – Volume 11, with a Twist! Today, I hate baseball. My fantasy team lost in the semi-finals. My slow pitch team went 1-3 on the weekend. The Jays… well, the Jays did not add to my love of the game. I’ll go back to loving it today, though… I think. As bad as things are, that does not mean there is no Stuff to evaluate! Sanchez struggled over the weekend, but it was more about his command than it was about anything indicating a more serious injury. His velocity looks great, and the curve ball is still dizzying. It was a less encouraging sign for J.A. Happ in his second to last start – throwing 80+ pitches in two innings (which, represent a really huge workload – more on that later). I am also lead to believe that Marco is feeling a bit better – the velocity has slowly come back, but now we need to see the results start to get back as well. Because I love Aaron Sanchez, and I’m not ashamed to say it – I leave you with this gif of him doing really horrible things to batters. It’s tough to say if hitters have just finally figured out Joe Biagini, or he’s starting to just come back to earth. His Stuff hasn’t changed; with the exception of a short period of time where he had a drop, it has remained legendary all season. Roberto Osuna also saw his Stuff come back to a season high in this volume of the Stuff Report. 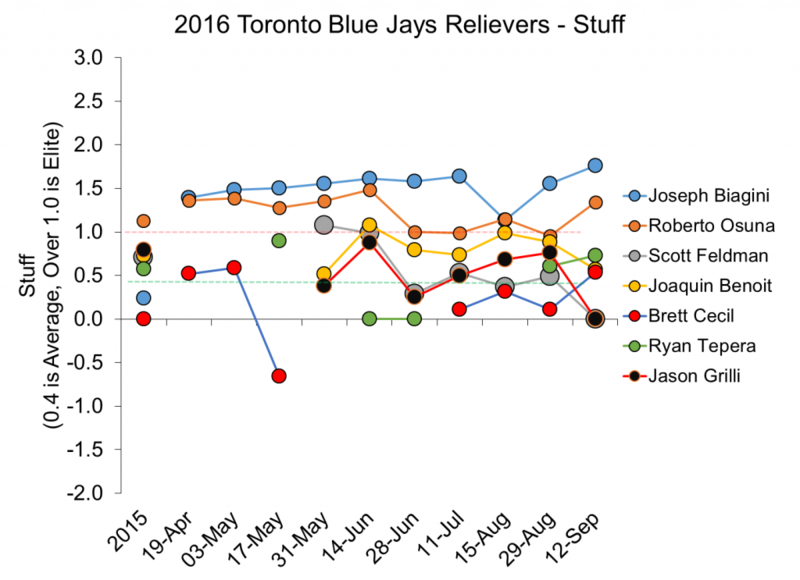 The other encouraging sign was the rebound from Brett Cecil to season-best Stuff levels. 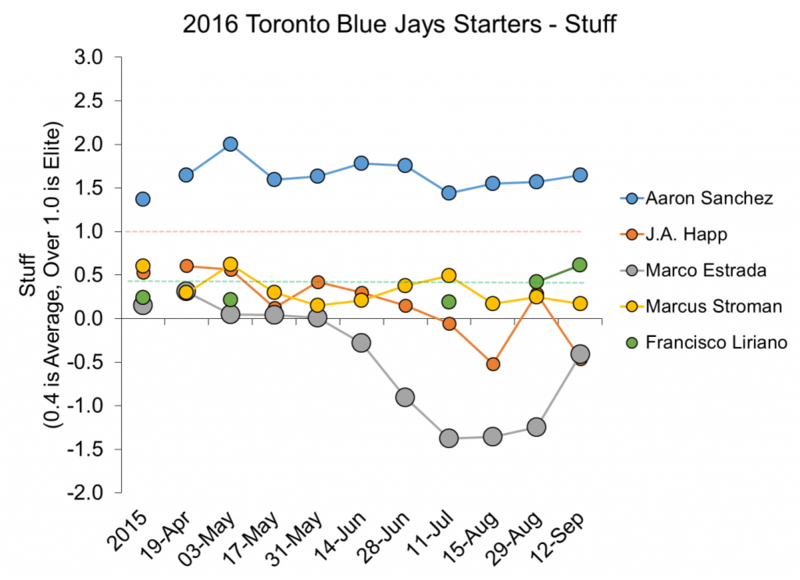 As we get closer to the end of the season – take a look at how all qualifying Jays stuff compare against one another. This represents their average Stuff over the entire season – not just the last two weeks. Biagini has a narrow lead over Sanchez – so it will be interesting to see if he can hold that lead until season’s end – and hopefully, through the playoffs! The winner gets all the internet points! What a coveted trophy! In my day job as an ergonomist, I try to protect Ontario workers from workplace musculoskeletal disorders. I use a wide variety of tools to do this, but one of them is a fatigue model that I created in my PhD. 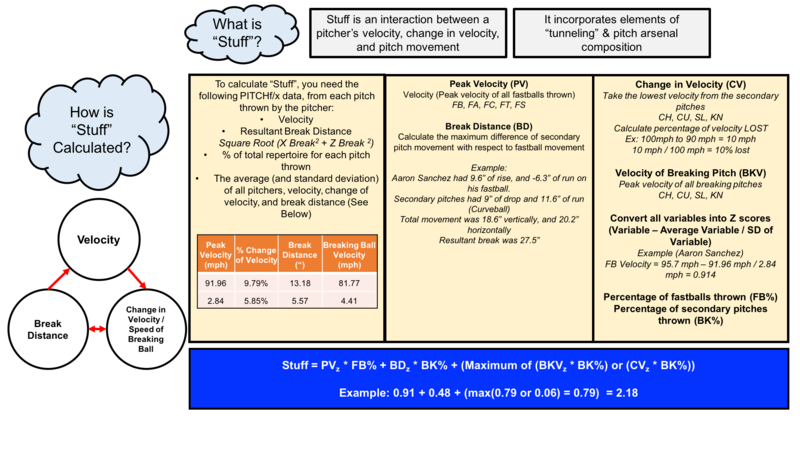 I’ve adapted the findings of this fatigue model to baseball pitching, and I recently wrote about a new metric for evaluating workload in pitchers. You can read all of my sciencey-mumbo-jumbo over on my site. In an attempt to quantify the workload of the Jays pitchers using FU’s (fatigue units), I present to you the list of hardest working Jays pitchers. On the left, are the rankings of workload seasons since 2007 – there are no thresholds (yet) which indicate a certain workload is dangerous, but you can see that at 36.27, Osuna has put in a workload season that is in the top 15 % of all workload seasons (since 2007). A paper by Whiteside and colleagues identifying pitching with fewer rest days and higher velocities as a risk factor for UCL reconstruction (Whiteside et al., 2016). 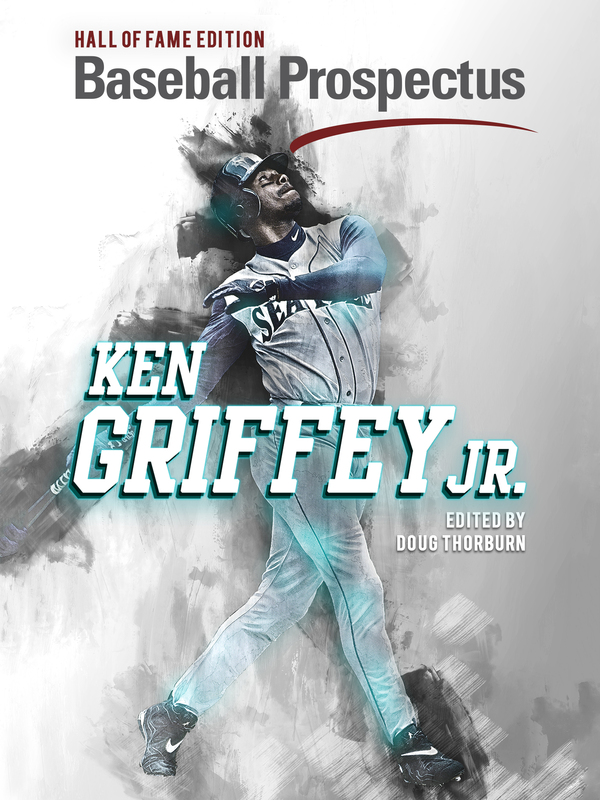 I wrote up how pitching faster (with less time between pitches), or throwing more pitchers per inning could lead to more muscle fatigue. I tried combining all of these principles into the metric, and this is what I found. Osuna and Biagini have thrown a lot of innings out of the pen – not as many innings as the starters, but – as we know, innings limits aren’t necessarily useful for injury prevention. Their consecutive day appearances are really what drive their workload up. I do find it particularly interesting to note – while so much has been made about Sanchez’s workload – Stroman has the highest workload of any Jays starter this season. His increase has been huge compared to the 2015 season. Another factor listed by the Whiteside paper for UCL reconstruction risk? Having a shorter stature. Enjoy the rest of the season – Go Jays!